← What’s belief got to do with it? In the days that followed, the story stayed front and center in the news and the biblio-blogs, while the focus shifted to whether or not the gospel was a modern forgery. This new direction of the story is best illustrated in a series of sort “essays” by Francis Watson as well as in a number of mainstream news outlets that reported that the Harvard Theological Review, the journal to which King submitted her article on GosJesWife, was considering not publishing it in the wake of the authenticity controversy. But whether or not GosJesWife was written in the 4th century or the 20th century is not actually all that interesting to me (for the record, I suspect it is 4th century, although here I defer to the papyrologists and paleographers who have also drawn that conclusion). Yes, I do Christian origins and am always happy with more data. But I am more interested in the ways in which the initial story was taken-up by the media, particularly the conservative reaction arguing it to be a modern forgery. Regarding the former, it seems we are still standing in the shadow of the Jesus Seminar. Popular interest is focused almost exclusively on the possibility that the historical Jesus was married, and not at all interested in the fact that, assuming its authenticity, people in the 4th century were telling stories about a married Jesus—a detail which I, for one, think is pretty neat! Regarding the latter, well, we are still in the shadow of the Jesus Seminar, only here we feel echoes of the conservative reaction against its version of the historical Jesus. Both of these positions ignore the interesting questions that can be, and should be asked of this gospel. Historically: what does it do for us studying Christian origins that a group of 4th (and perhaps 2nd) century Christians were telling stories about a married Jesus? 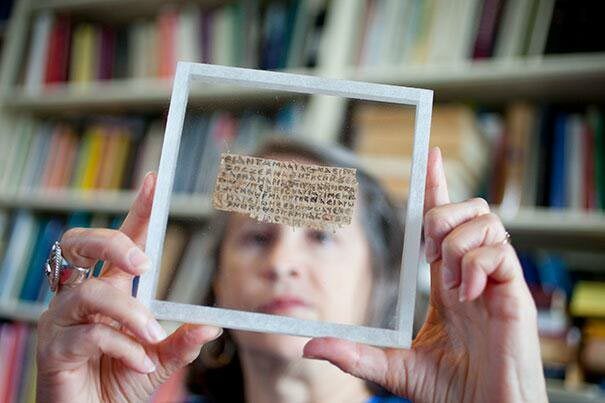 Contemporarily: why is a 4x8cm 1600-year-old scrap of papyrus getting so much attention? I think much can be said on the latter, but I shall leave that to you. This entry was posted in Ian Brown, Religion and Theory, Religion in the News, Theory and Method, Uncategorized and tagged GosJesWife, Gospel of Jesus' Wife, historical Jesus, Jesus Seminar, Karen King. Bookmark the permalink.